Rick Gaub is a career news vendor. He started selling newspapers in the Mission in 1965 at the age of 12. 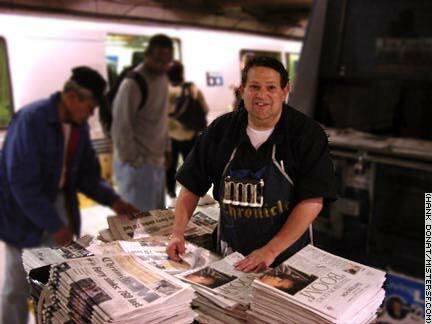 By the time the Chronicle PM ceased publication in September, 2002, Rick was already an institution in San Francisco for the newsstand he operated at the Embarcadero BART station. That's where Rick reimagined the afternoon headlines in puns and posted them on signs in front of his stand to the delight of amused - and sometimes bewildered - BART passengers. Countless commuters rolled their eyes over such gems as: "Oakland Coliseum Robbed During Ice Show - Heist Capades," "Designer of New Building was A-Edifice Time," "Saddam Tells Bush: You Mess with Me You Gonna Get U.S. Kicked" and "Judge Rules Kaiser Plan Must Cover Viagra. Have a Geyser Permanente!" When the Chronicle PM published its last edition on September 27, there was no other afternoon newspaper in the City. It was no longer feasible for Rick to run an afternoon stand at the BART station. Rick felt sentimental on his last day at Embarcadero, but told well wishers he would continue to sell the morning paper from his stand at the Castro Muni Station. So don't feel sad for Rick, or as the pun master might have said (but didn't), "Stop the De-Presses."